Visibly lifts sagging eyelids 20 to 91%. Illuminates and contours eye area. Creamy texture moisturizes without greasiness. 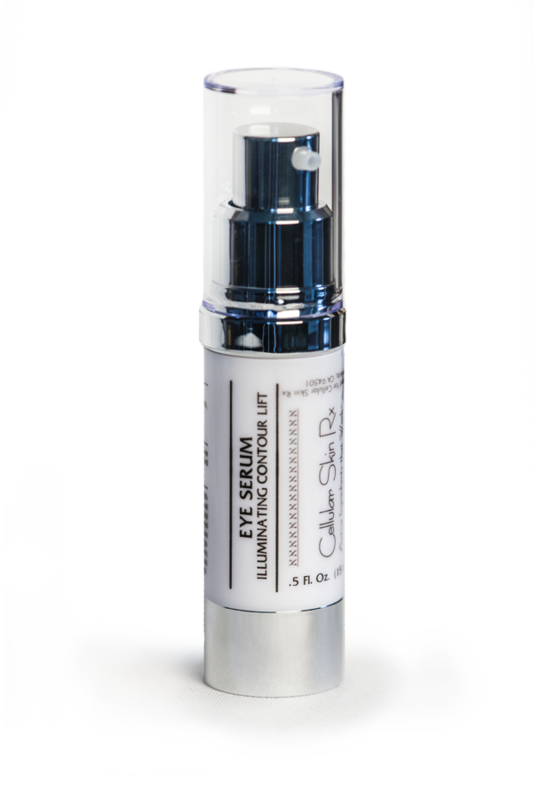 Luxurious lifting creamy serum illuminates, contours, and most importantly, restores the structural integrity of the upper eyelid. New ingredient complex, Beautifeye®, a proprietary blend of two plant extracts, combines Persian Silk Tree and Holy Herb to visibly lift the upper eyelid by 20 to 91%. The upper eye area’s structural integrity and natural contours are restored and the contraction capacity of the lid is measurably increased. Additionally, Beautifeye® removes lipofuscin, a yellow-brown pigment left over from normal cell metabolism. As we age, our ability to remove this pigment diminishes as circulation in the eye area is reduced. With regular use, these deposits are removed as circulation is improved. Dark circles are improved noticeably. Rubixyl®, the latest cutting edge engineered peptide, smooths deep wrinkles and lines in the crow’s feet area. This powerful peptide ensures that cellular communication is optimal resulting in increased protein and lipid synthesis. The result for you: super smooth, firmer, more hydrated skin. A combination of tetrapeptides (Uplevity®) and phyto-melanin (LipoShield®) restore the skin’s natural firming structure (collagen and elastin) and help to protect the skin from damage caused by exposure to High Energy Visible Light emitted from cellphones and computers. Niacinamide repairs and restores skin tone and radiance. Carob Seed Extract reduces redness and tissue damage while restoring skin’s natural lipid barriers. Mung Bean Sprout stem cells protect cell fibroblasts from adverse environmental insults stopping the wrinkle-forming inflammation cascade before it has a chance to start. This is a fantastic eye treatment product that truly shows results with regular use. No need for that eye lift now! Please allow extra delivery time for custom large size. Custom sizes are nonreturnable. Use twice each day. Apply lightly around entire eye area, up to the brow bone and down to the orbital bone for best contouring and lifting results. Niacinamide, Beautifeye® (Acetyl Tetrapeptide-2), Rubixyl® (Hexapeptide-48 HCI) Albizia Julibrissin Bark Extract (contouring), Carob Seed Extract, Mung Bean Sprout Stem Cells (Phaseolus Radiatus Meristem Cell Culture Extract), Liposhield® (Phyto-Melanin), Darutoside (brightener). Other Ingredients: Water, glycerin, isoamyl laurate, cyclopentasiloxane, dimethicone, polymethylsilsesquioxane, dimethicone crosspolymer, nylon-12 fluorescent brightener, caprylic triglyceride, sea salt, capryl methicone, polyvinylalcohol crosspolymer, tocopheral acetate, titanium dioxide, bismuth oxychloride, iron oxides, tin oxide, ethylhexylglycerin, phenonip. Use after antioxidant serums. Make sure to cover entire eye area. It’s best to feel for the bony structure around your eye and make sure that the serum is spread all the way to this structure. This is especially important for tightening the upper eyelid area. Do not apply only in the crease of the eye but above it as well up to the brow bone. You will enjoy beautiful results. As with all skincare products, regular use as directed for a full 30 days is needed to achieve optimal results.